You are invited to attend our Junior School performance of Freaky Friday on Friday, April 12th at 7:00pm and Saturday, April 13th at 2:00pm & 7:00pm. When an overworked mother and her teenage daughter magically swap bodies, they have just one day to put things right again. Freaky Friday, a new musical based on the celebrated novel by Mary Rodgers and the hit Disney films, is a heartfelt, comedic, and unexpectedly emotional update on an American classic. By spending a day in each other's shoes, Katherine and Ellie come to appreciate one another's struggles, learn self-acceptance, and realize the immeasurable love and mutual respect that bond a mother and daughter. For Freaky Friday we have the two leads; Hannah and Maya talk about their role in the play and their experiences in theatre. My name is Maya Faucher and I am the mother (Katherine) in Freaky Friday. Katherine is about to have her own wedding with her fiancé Mike. Katherine’s daughter Ellie is a typical teenage girl that Katherine has trouble handling sometimes. This will be my 6th play at KES. I was a daughter in the play ‘Fiddler on the Roof’, a backup singer in ‘School Of Rock’, a stepsister in ‘Cinderella’, and part of the ensemble in the plays ‘42nd Street’ and ‘Mama Mia’. 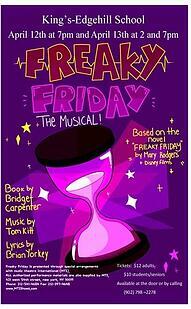 I am very excited to end my Junior School musical experience with such a fun play like ‘Freaky Friday’! I hope you enjoy our show! My name is Hannah Bryant and for this year’s Junior School Musical, ‘Freaky Friday’, I am playing the daughter, Ellie Blake. I love participating in musicals, being on stage singing and dancing is my happy place. Ever since I was young, I have competed in music festivals singing and playing the piano, so I was introduced to music at a young age. In Grade 6, I was Arial in ‘The Little Mermaid’ for my school musical. Last year in Grade 8 when I came to at King’s-Edgehill, I joined the Senior School musical, ‘42nd Street’, playing Phillis. Later in the year, I was the fairy godmother in ‘Cinderella’, the Junior School musical. This year I was in the ensemble for the Senior School musical, ‘Mamma Mia’, which was a blast. I am very excited about this year’s performance for ‘Freaky Friday’, and I hope to see you there! You will find countless opportunities to express your Artistic interests at our School. 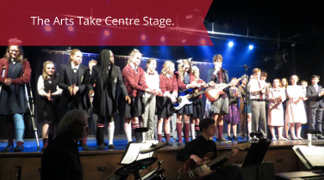 The Arts make up one of the essential four pillars of a King’s-Edgehill School education.